Dear All, I am sorry that I have been away for a while. When I say that I have been away for a while, I mean that I have not posted anything for The Culinary Council in quite some time. Some of you know that I have posted things on some other topics, that were promptly and extensively misquoted. However, I have not done any food posts. The reason I haven’t posted anything food related in a while is because for most of the month of June, I was in and out of the hospital, alternating between an only IV, clear liquid and an all-liquid diet. After I was finally released from the hospital I was still on a fairly strict diet, and once I was given the doctors permission to “eat whatever I want”, I was a bit slow getting back up to full speed. This was in large part due to the limited food options where I live, and not having the energy to really cook for myself. 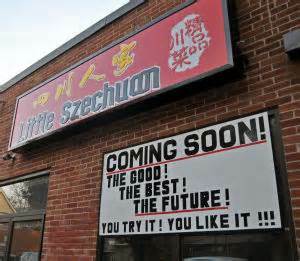 I knew this at the time, but my favorite Szechuan style, Chinese restaurant, Little Szechuan in State College, PA, is closed for the entire month of July for renovations. One might be wondering why I have never mentioned Little Szechuan in print before. I’ve never mentioned it in print before because, I was being selfish. I didn’t want this place mobbed. However, I’m over this particular selfishness and I want to do everything I can to ensure the success of Little Szechuan. I will be writing more about little Szechuan after they have completed their renovations. I happen to be in England at the moment. I’m here on a private pilgrimage and to convalesce. I may write more about this later, but I suspect I will not. Regardless, in the coming days I will be posting a series of articles about the food that is available in some of the coastal towns of southern England, including Swanage, Bournemouth and Studland Bay.